And a styling bust. What? Didn’t these used to be called Girls’ World? When I was a young mother this sort of advertising enraged me. Tsk! Girls doing housework while the boys get fun experiment kits! I’ve mellowed, and accept that girls (and quite a lot of boys) love playing with these toys. 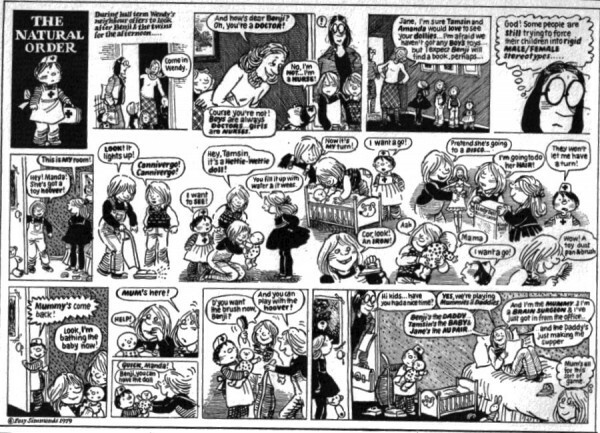 Wonderful Posy Simmonds said it all back in 1982. Rosie's best ever present was a grey plastic upright vacuum cleaner from my grandparents. Nothing ever came close. Posy got everything so exactly right. The expression on the styling bust looks positively malevolent. Something Midwich Cuckoo about her. She'd frighten me if I were a child but then I've always found bodyless heads rather creepy. I was utterly charmed by a video of my nephew pretending to hoover the hallway, especially movin the shoes out of the way and back again, but was aware that if it was a niece I'd find it a bit more dubious. His mother moves the shoes to clean? What a splendid example. I would love to be able to respond and say "no, his father does", but it is in fact my sister who does that! She is very domesticated, think she got my share. I was reminiscing once about the toy iron I had (it had a pink sucker you licked and stuck to the wall representing the plug, thus teaching highly safe practice with electricity) and my friend J said eagerly "I used to have one of those!" Then he realised he'd sounded a bit too enthusiastic. My in-laws have bought J some Christmas presents in Lidl's toy sale - a doll's house and a marble run. I can live with that! Even I would like a doll's house! I definitely never put such toys on my Christmas list when I was a kid! I think that's why the ad grates on me now! I did like such things when I was small. Aaaaw, shame. I'm sure those old ones were better looking than the hideous creature shown here. We do tend to look at toys like these through adult eyes and tend to forget that children copy adults, that's how they learn. 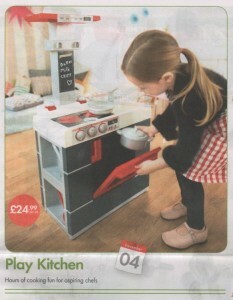 I know it might appear sexist to give girls a toy cooker or sweeper, but they see Mummy or Daddy doing the housework and cooking and naturally wish to copy them. To be given a doll's house in the 18th century would have served much the same purpose. Baby houses, for that was what they were called then, were bought by the rich, often as copies of their own homes, and were either proudly displayed by their adult owners or given to the daughters of the house as a means of educating them into how to run a household when they were themselves adults. Strangely, giving a young girl a doll's house seems far more acceptable than presenting her with a toy ironing board and iron or broom and dustpan, but the result remains the say - learning how to run a house through play. By the way, I love Posy's work - I have a couple of her cartoon books from the 1980s. They are great fun. True, and as I said, children do love the toys. I still object to separate marketing of toys for boys and girls and the way everything for girls has to be pink. I know much of Posy's work frame by frame, I love it so much.